NEW ORLEANS – There is a new sheriff in town. Texas Tech took over the No. 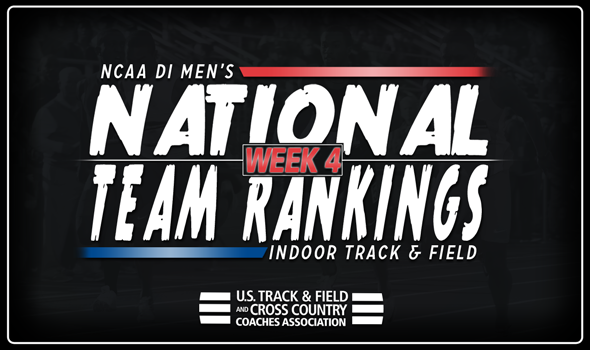 1 spot in Week 4 of the NCAA Division I Men’s Indoor Track & Field National Team Computer Rankings. The Red Raiders shot ahead of Florida, which had been billed No. 1 since the preseason. This is the first time in program history that Texas Tech headlines this rankings index. It should be noted that going forward, the National Team Computer Rankings will be calculated using only bests from this season. However, personal bests from previous seasons will continue to be used in calculations in the combined events. The Red Raiders own five top-5 marks this season, including two at the top of their respective events: Trey Culver (high jump) and Divine Oduduru (200). Charles Brown improved his spot on the Descending Order List on the triple jump this past weekend as he recorded a mark of 16.30m (53-5¼) and comes in at No. 3. Brown is also ranked No. 2 in the long jump. The Gators have four top-5 marks, one of which is a collegiate record. That would be Grant Holloway’s No. 1 time of 7.42 in the 60 hurdles. Holloway also had his hand in what turned out to be the second fastest time in collegiate history in the 4×400 (3:02.23). The fastest time in collegiate history in the 4×400, however, belongs to Southern California, which vaulted from 15th to fourth this week. The Trojans got the baton around in 3:01.98, which also stands as the second fastest time in world history. Michael Norman was part of that quartet – and earlier in the meet, he won the open 400 in 45.00, the fifth fastest time in collegiate indoor history. Florida State surged into the top-10 for the first time since Week 7 of 2014. The seventh-ranked Seminoles are propelled by Andre Ewers in the 60, Corion Knight in the long jump, Armani Wallace in the triple jump and Austin Droogsma in the shot put. Ewers is the best of the group as he’s ranked first nationally in the 60. Overall there were 11 teams – including those that were already mentioned – that jumped three or more spots from Week 3 to Week 4. Kentucky went from No. 18 to No. 10, TCU from No. 27 to No. 11, Syracuse from No. 19 to No. 12, Texas from No. 16 to No. 13, Michigan from No. 20 to No. 17, Ohio State from No. 45 to No. 20 (Its best ranking since 2014), Southern Utah from No. 58 to No. 21 (Its best ranking in program history), South Carolina from No. 31 to No. 22 and UTEP from No. 34 to No. 23. We’ll tabulate the rankings three more times this season in advance of the 2018 NCAA Division I Indoor Track & Field Championships, which will be held March 9-10 in College Station, Texas.